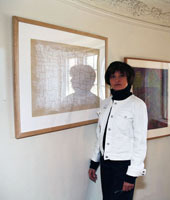 In an earlier painting, Untitled X, we saw the use of lines at the very edge of the painting, giving us a hint of framing. Here, in Untitled XII, the frame idea comes through as if it were the key to interpreting this painting. We’ve just looked at twelve works by this artist. I posted them in succession and with such haste in an attempt to simulate a gallery experience. When you see a solo show in a gallery you go from one piece to the next, you look close, you stand way back, you circle around, and you go back to something you saw earlier. You try to get a feeling for how this artist’s mind and imagination work. Notice that in Untitled XII the “frame” is not complete. Not only is it conspicuously broken, but it waves in and out of the other elements. Whereas in previous paintings, the crisp lines were placed on a field of undulating, bulging colors and we could talk about “background,” here background and foreground are interacting. The “frame” is not separate from or placed on top of anything. It is simply another element in the painting. Think of a painting as a conversation. You, the viewer, are half of the conversation. How you frame the conversation determines what you hear/see. Magritte comes to mind. 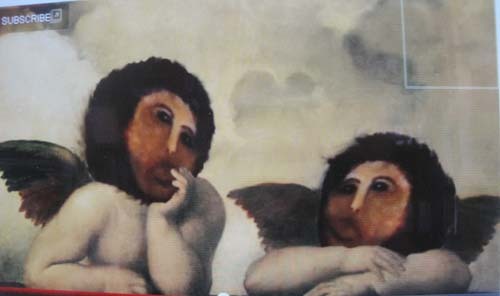 His paintings, as all humor, rely on framing or context. Here the frame or context is a neat, bourgeois living room, which sets up certain expectations and assumptions. A model locomotive mounted into a fire place would be jarring enough, but a locomotive moving outward from a fireplace—notice the smoke—is beyond all your assumptions about what’s possible. You can only take comfort from the realization that you are looking at a constructed image and not a real locomotive in a real fire place. Small comfort! You immediately realize that you love looking at this and that this was Magritte’s intention. You’re trapped, looking at something that you don’t understand. Sounds like the beginning of doubt and Cartesian introspection. Congratulations, you’re modern. A Magritte painting has one joke in it. Once you get it, it pretty much comes to rest. In Boyer’s Untitled XII you may see a bird or a face, but only fleetingly. The wit in a Boyer painting keeps ricocheting in your brain. Did Piet Mondrian Paint Mondrians? If you’re a Mondrian-lover you stand in front of one of his paintings, like the one above, and exclaim, “I just love the way he painted trees!” Right? You have a friend who doesn’t understand Mondrian, so you volunteer to give her a tour of the moderns at the Art Institute of Chicago or the MoMa. You position yourselves in front of the Mondrians, and you learnedly explain that here we have the essence of tree-ness. Right? Mondrian was painting simplified trees. Right? Mondrian drew diagrams of trees. Right? No one has ever looked at a Mondrian and seen trees. Right? 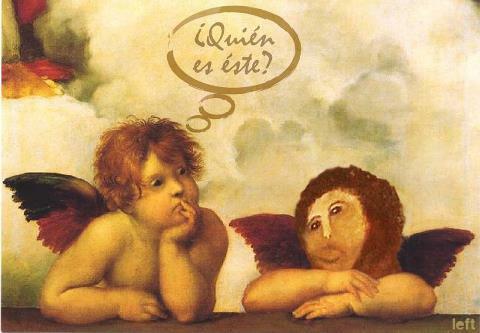 Then why do we constantly get the evolution of his paintings—The Mondrians—from trees. [The] process of simplification and reduction would continue until he wasn’t even painting from nature at all. The rise of Cubism also gave Mondrian a means to segment and reduce objects to their most basic forms. Dutch painter Piet Mondrian (1872-1944) lived in Paris when he was in his early 40’s. There he met Braque and other Cubists. To interpret Cubism as “reducing objects to their most basic forms” is as blatantly ridiculous as the other cliché about cubism, namely that a cubist painting shows us an object from all four sides. I’ll post just one example here, Picasso’s “Portrait of D.H. Kahnweiler,” 1910. Have a good look. You are seeing Mr. Kahnweiler’s “basic forms” and you’re seeing him from all “four sides.” Correct? Cubism is so scary to think about that people, even otherwise intelligent people, repeat these absurdities about “basic forms” and “four sides.” You’ll find this sort of thing not only on internet pages but, with more academic circumlocutions, in serious publications. The Cubists—Picasso and Braque–are scary to think about because they made a clean break with the past. Naughty, naughty. Thou shalt honor thy father and mother… The only father the Cubists honored was Cézanne and he, in Robert Hughes’ words, painted DOUBT. Let’s see now, we don’t have any commandments honoring doubt. In 1910, art that threw out all previous assumptions was difficult to take. Still is. But doubt is so much more invigorating than having answers without first having questions. Medieval certainties and Renaissance illustrations of mythological characters are not invigorating, are they?! The Cubists—and they didn’t call themselves that—came up with something new. The painting is now not an illustration but a work in its own right. You must be kidding? In its own right? The audacity! So, are Mondrian’s paintings abstractions or essences or diagrams of trees? No. They are something completely new. They stand in their own right as objects. Something to contemplate. 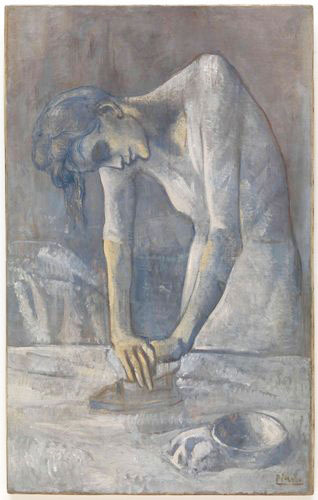 Yesterday the New York Times ran a two-page article about the analysis of his 1904 painting “Woman Ironing” which shows that it is painted over another painting, a portrait study, also by Picasso. Strapped for cash, he regarded the older, unfinished painting as mere canvas. The identity of the man is not nearly as interesting (though that is what fascinates the scholars and technicians who worked on this case) as the fact that Picasso abandoned the project and two years later thought it worthless. The painting hidden under “Woman Ironing” is a competent study, of course. Picasso had mastered all skills of drawing and painting by the age of fourteen. Conventional portrait painting would have brought in a comfortable living. But Picasso, age twenty-two, did not allow himself to be satisfied with his prodigious technical skills. He was penniless and lived in a hovel. He did not cave in. The old way of seeing the world had to be abandoned. How? And can you even do that? And what will be the new way? You sure? Of course not. But there is no evidence that Picasso ever doubted. His inability to doubt himself is not to be equated with complacency, however. He worked every day of his life, long hours, way into the night. He died April 8, 1973, shortly after getting up at 11 a.m., having worked, as usual, until 4 a.m. In 1910 in an ornate little church in Borja, a village in northeastern Spain, a local painter named Elias García Martínez filled a narrow white wall space with a little fresco called “Ecce Homo.” It shows a scroll on which the suffering thorn-crowned Jesus-head is turning its eyes skyward. 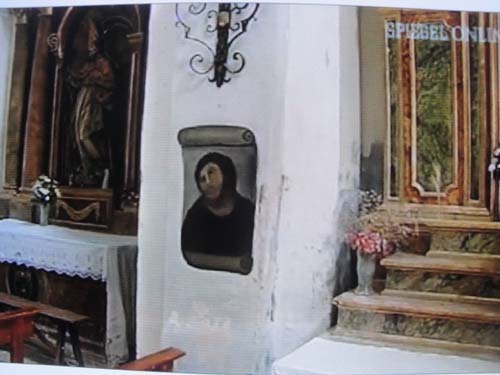 Over the years the fresco deteriorated and Mrs. Cecilia Giménez (below), with the permission of the priest, set out to restore it to its original, of which she had a photo to work from. 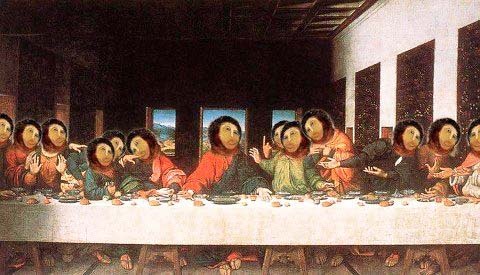 The news broke last Friday and over the weekend little Borja was overrun with hundreds of tourists who were eager to see what was universally called a “botched restoration.” One tourist, interviewed on Spanish TV, said that the original was nice, but this she really likes. Now what? What can the church and the town do? 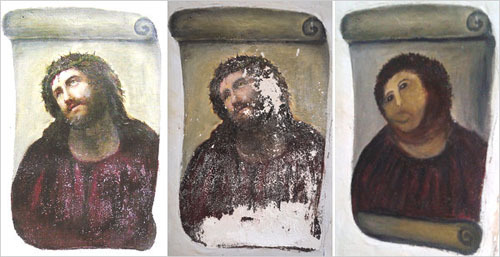 1) Paint over the fresco with white paint and forget about it. 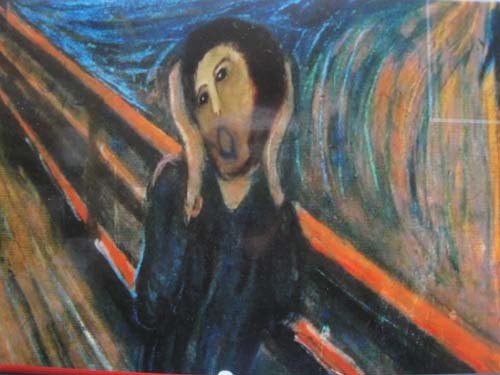 2) Hire a competent painter to duplicate the original and forget about the temporary embarrassment. Let’s consider option #3. The face as it is now is a confrontation with modernism. The modern mind is rooted in the 17th century, when Leeuwenhoek first saw microbes through his microscope’s lens, Montaigne (a little earlier) introspected and doubted, Descartes doubted himself to exhaustion and John Mill studied various translations of the Bible and said, whoa, we have 30,000 problems here. To name just a few of the people who showed us that things are not what they appear to be and that the mind makes stuff up. 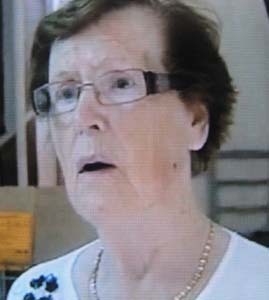 Mrs. Giménez, in her mid-80’s, is now world famous. She is notorious. How could she do such a thing? She’s apparently surprised at the results of her effort. Is she crazy? Couldn’t she see what she was doing? She may be asked to have her head examined and her introspection and free-associations would be interesting, but not as interesting as the FACT that we now have this image she made up. That’s what’s important: she made it up. 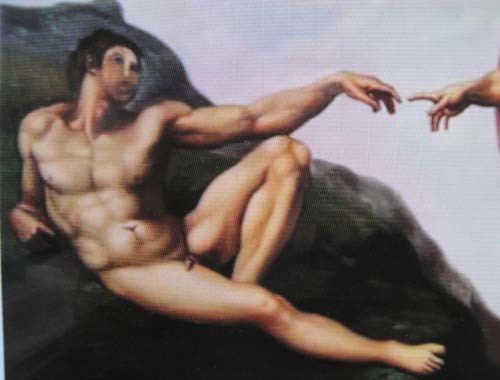 And another thing: the original fresco from 1910 by whatshisname was also made up. Let’s see, what else can we name that’s been made up: Michelangelo’s David, Michelangelo’s Adam, Rafael’s madonnas, Leonaro’s Last Supper; Klimt’s Kiss, Munch’s Scream; Egyptians invented Isis and Osiris, the Greeks invented Zeus and Athena, and so on and so forth. The human imagination makes stuff up. You won’t find that statement anywhere in the 12th century. The clerics who are ringing their hands over this fresco problem haven’t traveled through the 17th century to the beginning of the 20th, when Picasso and others blew the roof off our skulls. 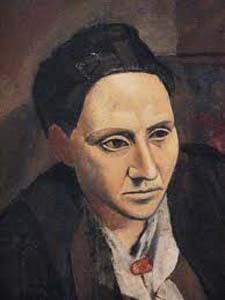 When Picasso painted Gertrude Stein 1905 and 1906, she sat for him an estimated eighty-plus times. Towards the end of 1906 he got stuck, dissatisfied with how he had painted the face. We can only wish we had a documentation of that stage of the work. (We know Picasso owned a camera.) 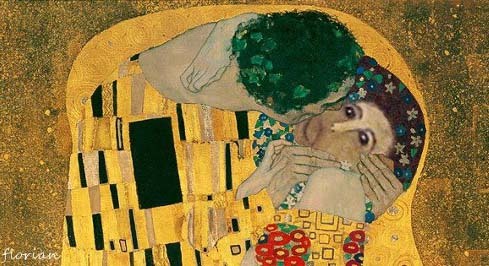 In the fall of 1906 he went to Spain and when he came back he painted over the face. 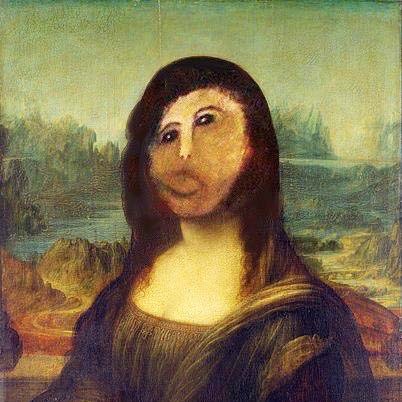 Giving into his fascination with African, Oceanic and early Iberian art, he now turned Gertrude’s face into a mask. In other words, he invented. He made it up. We look at this painting at the Met and think it looks like Gertrude Stein—after all, that’s the title on the wall label—but at the same time we know IT’S ALL MADE UP. It’s this awareness that makes us modern.